Sharing warm, supportive Filipino parents with two sisters and a brother, Ayuyang (Whirlwind Wonderland) ties this loosely episodic memoir together with exuberant art and a song-and-dance theme. The author’s family life throughout childhood occupies half the book, as she copes at school with bullying while escaping at home into disco and TV dance programs plus Fred Astaire and Ginger Rogers movies. Subsequent episodes chronicle her pregnancy and the birth of her son, fan fascination with Dancing with the Stars, her burgeoning career as a cartoonist, and a fan letter to Stanley Donen for his skill at directing dance-rich cinema. The concluding piece, “The Ballet That Always Comes at the End of the Musical,” sweeps through the easy, collaborative relationship among Rina, husband Ken, and son Finn, all moving through life together. Vibrant, loose drawings in rainbow pencils cascade down pages without panel borders and feature numerous lyrical renditions of dancing couples. 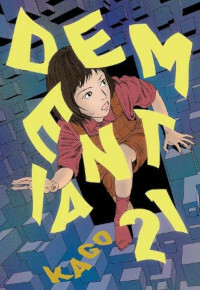 The 17 stories gathered in the latest release from manga artist Kago ( Super-Dimensional Love Gun) are all concerned with the misadventures of plucky young home health aide Yukie Sakai, whose attempts at garnering positive feedback from her elderly patients is constantly spoiled by bizarre and surrealistic events. A woman with supernatural powers slides into senile dementia, causing everything she forgets suddenly to cease to exist. A gigantic superhero modeled on the classic Ultraman character bonds over the torments of aging with his alien enemies. In one story, wrinkles become infectious and start spreading to the young; another sees a woman take advantage of her mother’s wrinkled body to become a drug smuggler. Somehow, Kago has pulled off the unlikely feat of exploring aging and the role of senior citizens in modern society with a kinetic illustration style and a twisted sense of humor. Morrison (HAPPY!) and Paquette (Terra Obscura) continue their story of Wonder Woman in this second volume of a new series. Diana, Princess of the Amazons, has joined Man’s World in order to bring peace and love to their societies. Unfortunately, not everyone sees her arrival as a good thing. Battling Nazis, weapons-makers, and misogynists might not be enough to keep Amazonia safe, especially when a threat from within emerges. This sequel is just as entertaining as the first book. Colorful panels keep the action moving, while the story draws readers into Diana’s adventures. The various costumes Diana wears are particularly impressive and create depth for her character.